Charcoal is the choice for purist BBQers. It cooks your food in the simplest way possible, using flames, smoke and direct heat. If you’re looking for a way to grill outside simply and effectively then a cheap charcoal grill is a great way to go. We’ll tell you everything you need to know about cooking with charcoal, give you some quick tips and tricks and let you know our choice for the best charcoal grill under $200. Charcoal normally starts its life as normal wood. But it can also be agricultural waste or even animal bones. The wood is then burned in a process that is aimed to remove all volatile compounds such as water. This is done in a very low oxygen environment. The process can last days but is stopped just before to wood is turned completely to ash. The result is charcoal. Almost pure carbon that weighs around a quarter of the original weight. In comparison to wood, charcoal burns steadier, hotter and produces fewer dangerous gases. Super easy for beginners to get great tasting food anywhere due to the portability and low costs of most charcoal grills. Not having to carry around a bottle of propane or know how to hook it up means almost anyone can get a true BBQ taste wherever they are. Charcoal can reach very high temperatures which makes searing steaks or lamb chops super easy. It also gives some of the best results, the only better way to sear is on an infrared grill but these will cost you significantly more than charcoal grills. There is a unique smoky flavor that comes with charcoal. If you’re grilling something for 10-15 minutes you probably won’t be able to taste it, but if you roast or smoke something over charcoal you’ll start to get strong smoke flavors the longer you cook it for. 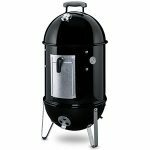 These are most prominent when you use a dedicated charcoal smoker to cook your food low and slow. The smoke doesn’t only come from the burning of the charcoal itself. Your food will drip oils and fats onto the hot coals that will give off a flavor infused smoke that will add to the taste. This is only really possible on charcoal as gas and other grills will tend to use metal plates to protect the burners and stop the food drippings. Charcoal can produce real flames that can give your food a flame-kissed touch to add an extra layer of flavor. Charcoal is dirty and messy and leaves ashes that need to be carefully cleaned up and disposed of. If you don’t know what you’re doing, charcoal can be difficult to light. In our ‘How to Make the Most of your new Charcoal Grill’ section later in the post, we’ll take you through everything you need to know about lighting a charcoal grill so it isn’t a problem. You have less control over the cooking temperatures in comparison to gas. This can be made more manageable by setting up a two zone cooking area. Keep one side of your grill hot, using direct heat from the coals to cook the food. Then use the other side as an indirect heat area without any coals underneath for a lower temperature, more manageable cooking area. Also, always use a good digital thermometer so you know exactly what temperatures you’re dealing with. Charcoal can cause flare-ups. These can be from a number a reasons, such as drippings from the food. If you’re not careful these unpredictable events can easily burn your food. Charcoal isn’t a consistent form of heat. It will start to get cool after a while and will need to be topped up. Another reason to get yourself a digital thermometer to help you monitor what is going on under the lid of your grill. There is a slightly higher risk of fires with charcoal grills, so some places will not allow them. 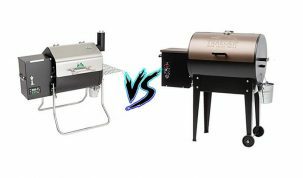 Read through our list of the best gas grills under $300 to see if a gas grill would be a better suit for your needs. 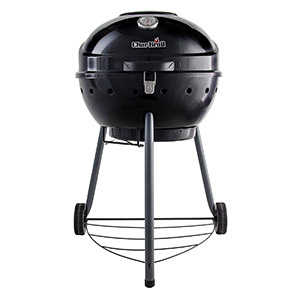 The Weber Kettle is one of the best selling and most popular grills ever made. It comes in a range of many sizes and colors, all of which are worth your money. We’ll look at mid range version that includes the ash catcher. With a 22 inch diameter steel cooking grate it gives it a cooking area of 363 square inches. It has a brilliant ash catching system that makes ash removal very easy. There are two heat resistant nylon handles for safe removal of the lid. The build quality is fantastic and the performance matches. There are multiple vents to allow a very versatile cooking system and helps you to maintain a lot of control over the internal temperatures. Two wheels that make for easy movement. Hinged cooking grate makes it easy to add charcoal. Aluminized steel One-Touch cleaning system makes clean up hassle-free. Can easily be converted into a smoker if you want true low and slow cooking. 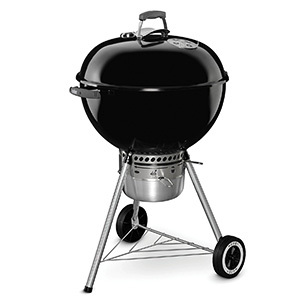 If you’re looking for a brilliant all round charcoal grill then you can’t get much better than the Weber Kettle. The brilliant build quality will allow the Weber Kettle to hold its temperatures very well, whilst having the versatility to allow you to alter the temperature with simple adjustments to the dampers. This means beginners and veterans alike will be able to easily cook whatever they want with relative ease. Usually charcoal grilling takes a little practice to get right, but with the Weber Kettle you’ll be a master almost instantly. It’s not just how well it cooks that makes it the best charcoal grill under $200. 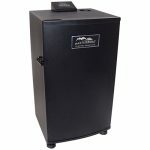 The additional features that take all the hassle out of using a charcoal grill make it truly the best. The assembly is now super easy with the new spring loaded push pin. This improves one of the worst features of the old Weber Kettles. The legs still do feel a little flimsy and tend to wobble a little but this is great improvement overall. The one thing we’re not really fans of is not having a hinged lid. There is a hinge accessory that can be bought and installed that does a decent job at fixing this. Overall, it’s not a big deal not having one and has a decent fix anyway. The Char-Broil Kettleman is a very similar grill to the Weber Kettle. It has almost the same cooking area at 360 square inches, has a similar design and has a removable ash pan for easy clean up. But it does have some noticeable differences. It uses a heavier gauge steel and aluminum in its build. This doesn’t necessarily produce a better quality grill but it does feel sturdy and strong. Some people have reported the paint peeling after a few cooks but the one we’ve used had been used several times prior and its paint was still fine. The biggest difference is in the grate that the Char-Broil uses. It’s one of Char-Broils Tru-Infrared grates that is said to give an infrared style grilling. Check out our guide to infrared grills to learn more about how these work. It does take a little getting used to as this type of grill is certainly different to a standard charcoal grill. What it does well is increase the consistency of the cooking area. The whole thing heats up very nicely and gives a very uniform area to cook on. It also reduces flare-ups well and has a lip around the edge to stop food from sliding off. Infrared grills are very fuel efficient and this uses roughly a third less fuel than a normal grill. They are also ideal for searing as they reach very high temperatures. 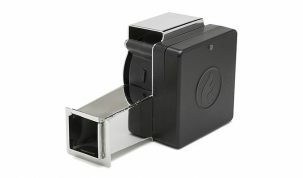 A hinged lid that can lock down when transporting. Two wheels offer easy mobility. Chrome-plated wire bottom shelf for stability and convenience. Built in thermometer for basic temperature readings. There are always going to be comparisons to the Weber Kettle but these are two different grills. The Char-Broil features a lot for the money. There are some nice features that we’re surprised the Weber Kettle hasn’t yet included, such as the hinged locking lid. All these features are included at a price that is generally under $100, which is incredibly good value for money. This is a very different way of grilling though; infrared grilling is quite specific. 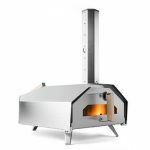 You won’t be able to smoke on this and roasting is tricky due to the high temperatures that it naturally reaches. We highly recommended both this and the Weber Kettle, but if you want a more traditional grill then we’d say go with the Kettle. If you want a different type of grill, that can still manage standard grilling very well, then this is definitely worth a try. If you’re looking for a super cheap and incredibly portable grill then Weber has a great choice for you. 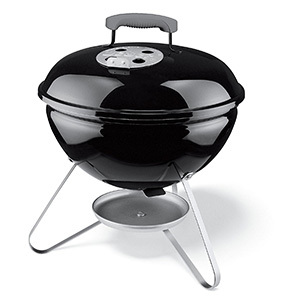 The Smokey Joe has a 14 inch diameter cooking grid which is triple nickel-plated. This is enough room for around 6 burgers. That makes the Smokey Joe ideal for taking camping or tail gating. Glass reinforced nylon handle that allow you to easily remove the lid as needed. These are the same as on the Kettle and are just brilliant. The Smokey Joe has the same porcelain enameled coating as the Kettle that prevents rust and fading. It includes a 10 year limited warranty. You will sometimes be able to find this grill for less than $30. For that you get a grill that can comfortably manage a decent amount of food for 1-2 people at a time. It’s surprisingly fuel efficient, easy to assemble and it produces great tasting food. And being so compact allows you to take it pretty much anywhere. There are a few small problems we have with it though. It doesn’t have side handle to lift the actual grill when it’s hot. This is a pretty big feature that’d we’d be happy to pay an extra $10 for. There have been multiple times when we’ve needed to move the grill when it’s still hot but have had to find a work around. Either that or some clips on the lid to allow you to carry it by the top handle. These are small complaints and for the money we don’t expect everything. If you’re looking for a small, portable, great value for money grill then the Weber Smokey Joe is perfect. We highly recommend using a Kamado as your primary charcoal grill. They are incredibly versatile and can cook in almost any way you can think of. 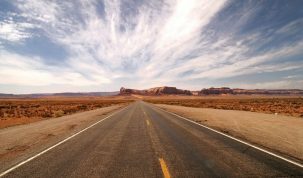 They tend to be premium products and can cost well in excess of $1,000. But that doesn’t mean you can get a decent one for less than $200. 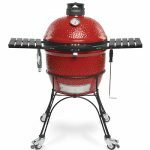 The Akorn Jr. is triple-walled insulated, steel built Kamado that is by far the cheapest Kamado grill on the market. Steel isn’t as good as ceramic at retaining heat but the Akron Jr. does a very good job considering its price. Its shell is made from 22-gauge steel and it can maintain cooking temperatures ranging from 200°F (93°C) – 700°F (371°C). 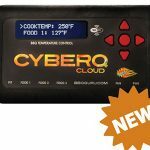 This temperature range means it makes a great little smoker as well. The steel has a powder coated exterior and a porcelain coated steel interior finish which help it regulate the internal temperatures. You’ll get very consistent temperatures due to these finishes on the steel. There’s an ash pan that makes cleaning up and disposal of ash very easy. There are also two adjustable dampers, one at the top and one at the bottom which allows you a lot of control over air flow and internal temperature. Sturdy handles to allow portability. This Kamado is perfect for camping and tailgating. 154 square inches of cooking space. The Char-Griller Akorn Jr. is a great charcoal grill for the price. It has a very simple assembly and you can be grilling or smoking very quickly. It’s ideal for someone looking for a portable grill that they can take camping or tailgating. 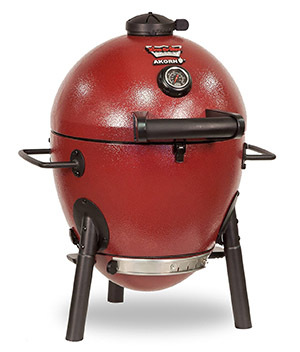 We’d recommend something a bit bigger and better made if you’re looking for a quality home Kamado grill. If you’re looking to try a Kamado grill then we’d definitely recommend the Akorn Jr. It’s cheap and works very well. Overall, it’s definitely the best budget Kamados so easily made it onto our list of best charcoal grills under $200. Despite Charcoal being made about as easy as it’s ever going to be, it still requires some effort to light and maintain. If you’re not completely set on using a charcoal grill, a charcoal and gas combo grill could be a great alternative. The Char-Broil Hybrid Grill is a good option for this and is generally around the $200 dollar price point. It uses 3 gas burners in the main cooking area and a secondary gas burner to the side for frying. The gas part of this system works well enough. It’s a little weak, the burners are rated at 10,000 BTU, which is fine but you won’t reach the highest temperatures. But it has the advantages of gas. 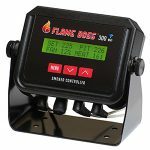 It’s very easy to light, has consistent temperatures and will burn cleanly and efficiently. When you want to use charcoal you simple place a tray into the cooking area, under the grates. Place the charcoal in and then use the gas burners to ignite the charcoal. This works fairly well. The problem is that you can only fit one layer of charcoal, and as it’s a gas burner there are no vents to control the temperatures. This can make cooking a little more inconvenient that with the other grills on the list, but none of them have the ability to use both fuels. Small footprint for easy use in smaller gardens. Built in thermometer so you have a basic temperature reading. Nice cooking grates made from easy to clean porcelain coated steel. Good clearance under the lid. Easily enough for a beer can chicken or a medium turkey. 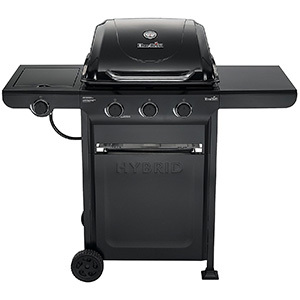 Overall, this is a decent hybrid grill. It’s party trick might be exactly what you’re after and if it is then you’re not going to get any better for under $200. If not then we’d say you’re better sticking with the Weber Kettle. Ultimately the type of charcoal won’t have a huge impact on the results of your cook. Especially if you’re sticking to short grills and aren’t thinking about smoking. The type of meat, the temperature it’s removed at and the rubs and sauces will have much more of an impact on the taste of your food. But the type of charcoal used can have a big impact on cleaning up, the consistency of the cook and the temperatures you’re able to reach. There are two main types of charcoal. Lump hardwood and briquettes. Lump charcoal is the traditional charcoal that you think of when you hear the word charcoal. It tends to burn hotter and quicker than briquettes and as there are no fillers in lump charcoal you’ll get a cleaner burn with a lot less ash. Briquettes are made from crushed left-over charcoal. This is bound together with binders such as cornstarch and other fillers, depending on which brand you buy. These can include lighting fluids and chemicals that are likely to taint the taste of your food. The chemicals and lighter fluid won’t harm you and they’re not poisonous but are sometimes very noticeable when eating what you’ve cooked. This is how they’re so consistent in shape and size. This composition of charcoal dust and fillers mean that they are very steady and consistent burners. They’re not able to reach the high heats that lump charcoal can reach though. We prefer lump charcoal over briquettes and you get a cleaner, hotter burn with less ash. Briquettes are fine to use but we recommend trying to find some that don’t use lighter fuels or nasty chemicals to bind them. Read our complete guide on Lump Charcoal vs Briquettes for more information. Get good a lighting it. This is essential and can be made a lot easier with a chimney lighter or an electric lighter. 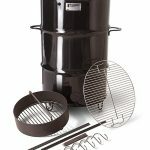 Read through our guide to using a chimney starter, our preferred way of starting a charcoal grill. 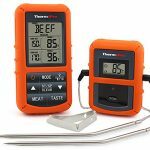 We highly recommend using a good quality digital meat thermometer. 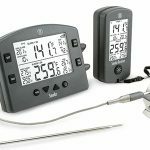 This is very important as the thermometer on your grill won’t ever be as accurate as a digital thermometer. Use our times and temperature chart to see the temperatures at which different foods are done. Try using the two zone cooking system. Simply put, this is where you pile all the hot coals to one side of the grill and place the meat on the other side. The meat should be under the vent. This creates a flow of heat around the inside of the grill that will perfectly cook bigger chunks of meat. You can even stick a burger or two over the coals so they cook quickly whiles dripping onto the coats to add extra flavor to the meat on the other side. If you’re buying a Kettle grill then it might be worth looking at something like a Slow ‘N Sear to turn your grill into a top of the range searing grill and smoker. When adding charcoal or lumps of wood use tongs to carefully place them on the hot coals. There is no need to stir the coals or place the charcoal deep in the hot coals, directly on top will work fine. Make sure you season your new grill, if it says to in the instructions, using our seasoning guide. Stock up on accessories to make cooking on your grill as accomplished and easy as possible. Check out our guide to the most essential BBQ accessories for more information. Charcoal grills are a great way to get into outdoor cooking. They’ll give you fantastic tasting results, whilst being fairly simple to use. We think charcoal is the best fuel for grilling if you have a bit of time to tend to the coals. If you know you’ll sometimes be limited with your time, then maybe a gas and charcoal combo grill is the one for you. Or if you’re looking for a great all round cooker, then a Kamado is a great choice. We’d probably recommend saving up a bit and getting something bigger and made from ceramic if you want a home Kamado. The Akorn Jr. is a great camping or tailgating option. 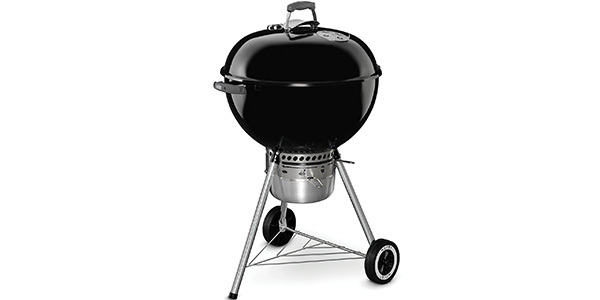 However, if you’re looking for the best all round charcoal grill we have to recommend the Weber Kettle. Time and time again it’s proven itself as the best and we don’t see that changing any time soon. 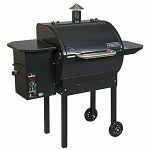 This compilation of best charcoal grills under $200 helped me a lot to sort out grill for my outing.